Beccy's Place: Day 7 - Bingo! You might be a little bit surprised about the prompt for today's challenge... I'm sure many were expecting to see a "G", and have probably even prepared for that. But don't worry, tomorrow we'll head back to our alphabet theme so no"G" cards will go to waste. 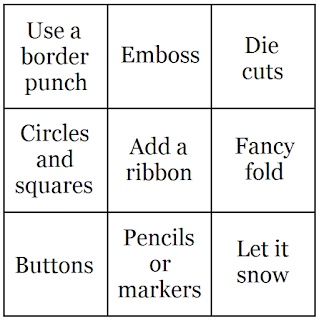 Today's challenge is a bingo grid. I remember playing these challenges way, way, WAY back when I first started scrapbooking. They were a great way to get the creative juices flowing and also to use techniques and products that might have been neglected. Simply select one line from the grid and make a card that features each of the items specified. Your line can be vertical, horizontal, or diagonal depending on what appeals to you. For instance, if you chose the horizontal, middle line, you would have to make a card that featured circles and squares, ribbon and a fancy fold. Easy right? I chose a diagonal line, starting in the top left box and ending in the bottom right - use a border punch, add a ribbon, let it snow. 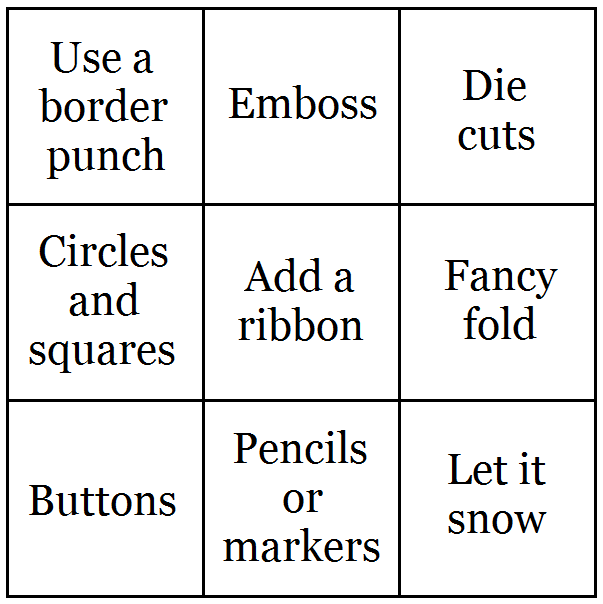 Your turn: Use one line from the bingo grid to create a card. Sweet card and a fun challenge. And you're right: I wasn't expecting this. Guess I will have to add some ribbon on my next card lol. I love to play bingo, in real life and as a challenge. It always stretches your imagination when designing a card. Love your card, Beccy! That border punch is beautiful and I love how you used two different but similar borders. Adorable snowman and papers and the sentiment is so cute! We had snow for the first time last week. It didn't last very long since the ground is really quite warm but I know it's just a matter of time before we get snow for keeps for a while. Thanks for the inspiration! This is so clever! I can't wait to get started this evening and see what speaks to me. Snowmen are my favorite and I love your sentiment! Fantastic inspiration for a challenge, thanks! I am a little behind but will try to get in soon. I am excited about the Bingo. Love the color scheme on this sweet card. Their cool tones just call our, BRRRR! I knew we were going to be 4 short but thought the extras would be at the end. Keeping us on our toes by throwing them in randomly works too! Your card is gorgeous Beccy - definitely keeping the bar high for us! I love to play crafty bingo, it usually pushes my creative limits and I'm always thrilled with the results! Who doesn't love a good bingo challenge? Thanks, Beccy. It's like a little break before we get to the next 4 challenging letters. Cute card and fun challenge! Totally threw me for a loop with this, Beccy! I already entered my G and my H, haha! I do love a good Bingo board and this one will be fun! I don't have any border punches but I have lots of border dies - hope they will qualify. I'll see what I can come up with! Your snowman is sooooo cute - love these soft colours! Also love your ribbon bow! Thanks for the inspiration! That is a lovely, delicate card - what a pretty scalloped border. Company is gone, and I am ready to get serious about some Christmas cards. I may not get totally caught up, but I will try!